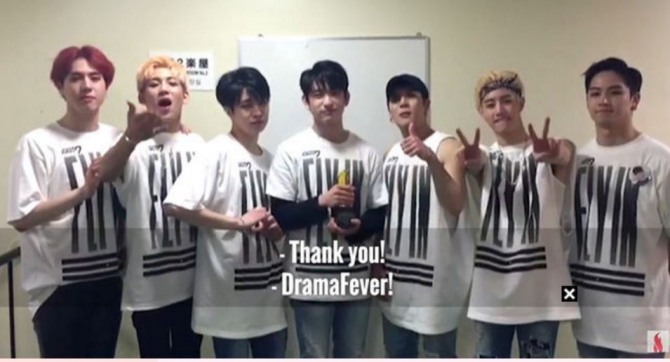 “Dream Knight,” a Web drama starring GOT7, was named best K-Pop act in drama by Dream Fever, a streaming site widely used in the United States for downloading Asian drama series on Monday. The Web drama was jointly produced by JYP Pictures and two Chinese video platforms, Yukou and Tudou. It aired from January to March in 2015. “Dream Knight” continued to amass viewers even after it ended in March last year, and as of September, it had accumulated over 100 million views. It was also the first Web drama to be released on DVD in Korea and Japan. The show also received the Best Drama Award, Best Director Award and Rising Star Award last year at the K-Web Fest in July.